Virginia is a quintessential area for luxury homes built with only the best designer home features. With the holidays upon us, you can throw the most fantastic and beautiful holiday parties in your new construction home. 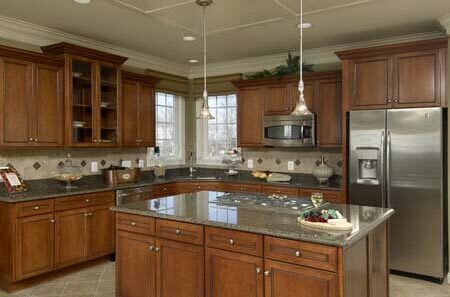 Carr Homes, your luxury home builders, wants to give you an extravagant home that is also welcoming and warm. Our community, Meadows at Great Falls, has interior features in all areas of the home, and exterior features which your guests can enjoy the minute they drive up to the house. Imagine yourself living in our luxury home, and the parties you can throw, with this guide through the home, focusing on important features. You and your guests can park in the garage and have plenty of space in the stone driveway. There won’t be any need to park on the street and walk to the house. Your guests will also be guided into the home by Coach lamps, installed along the driveway and entranceway. 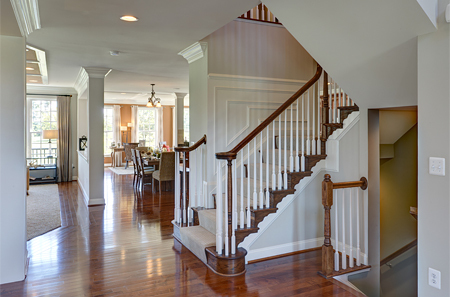 Visitors will be immediately welcomed, not only by you, but by the two story foyer. With impressive views from the entranceway to the rest of the house, your friends will ask for a tour of the luxury home as soon as they take his or her coat off. They will feel the immense grandeur of the interior house design and will soon feel at home. Invite party goers into the grand kitchen to settle in and to grab a snack and a warm holiday drink. Some guests can sit at the granite countertops and there’s still enough space for other people to mingle as they please. With impressive cabinets and stainless steel appliances, there is a considerable amount of refrigerator space for trays and cooking supplies for the holiday dinner. Our designer homes are built with thousands of square feet, you may think there is potential for guests to wander and become lost. But with light fixtures and recessed lighting in the kitchen and hallways, there will always be a path to be guided by. Guests can roam the house with ease. The hardwood flooring in impressive rooms gives style and class that a luxury home requires. 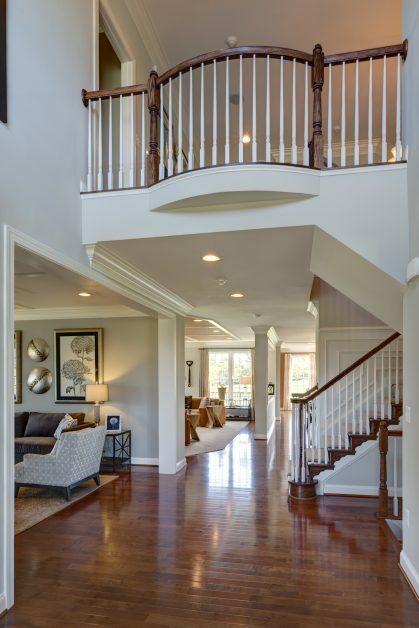 Guests will feel at home, and may even want to take their shoes off, with this warm hardwood in the foyer and leading into the kitchen and breakfast room. Sit down with your friends and family for a special holiday meal in the classy dining room. Big enough to fit your whole party with ease. There is no need to worry about having enough elbow room, the family and the kids can sit comfortably at a table in this dining room. After dinner, the group can relax and reminisce in the family room around the gas fireplace. Cozy up and let the warmth of the fireplace set the mood. Laughs will be heard throughout the house when holiday cheer sets in. Curl up with a good book, or chat with a friend about other holiday plans. A friendly and inviting room, the family room will be a favorite place to gather. When the evening is over and the guests have retreated, you can unwind in the owner’s bedroom. Soak in the oversized tub replaying the events of the night in your mind. Also enjoy marble vanity tops and ceramic floors. If you still have presents to hide or stow away, there is ample room in the walk-in closet/s. All of the luxury homes in our Meadows at Great Falls community offer these fantastic features, and more! Take advantage of our home builders experience and expertise and see for yourself what kind of home you can make memories in. Imagine the things you can do in your designer home. Holidays, birthdays, slow moving Sunday afternoons, busy Saturday evenings will all be a part of your life in our luxury homes. Carr Homes only builds luxury homes that are the epitome of style and class. You will appreciate our attention to detail when you contact our home builders at Carr Homes.